Apparently, the only thing I can pay attention to when I watch movies and TV shows is the food. This time, I was watching a past episode of Glee (*sigh* I miss Glee!) and there was grasshopper pie. 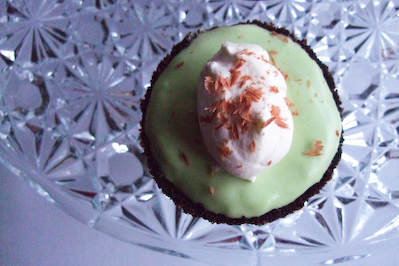 Here in Australia, we don't get grasshopper pie and most people haven't heard of it. The mere mention of the name raised suspicious eyebrows and wrinkled noses when I mentioned it. Apparently my friends now think that I'm insane enough to put real grasshoppers in my desserts, which is kind of great. But I loved the sound of this pie, with its chocolate biscuit crust and a fluffy, marshmallow-like peppermint filling. Also, they were appropriately green, just in time for St Patrick's Day! 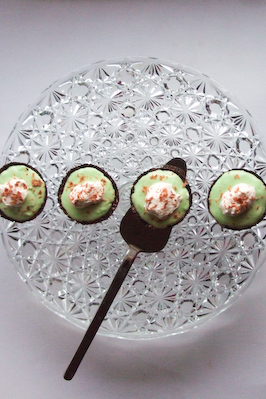 I've always loved the combination of peppermint and chocolate. But I get the feeling it's a combination that you either hate or love. And I've come across some people who just can't stand it, but most people I know adore it. I think this may be one of the best ways to enjoy the combination, apart from after dinner mints, mint choc chip ice cream and these chocolate peppermint creams. The filling is light and super fluffy, like a peppermint cloud! And the biscuit base nicely compliments the filling in taste and texture. I decided to test out a Martha Stewart recipe, after doing a bit of research on the grasshopper pie. It seemed appropriate to be using a Martha recipe for some reason. But I wasn't too happy with the texture and flavour of the filling, and was also trying to figure out the best chocolate biscuits to use for the base. I've made quite a few changes in my recipe, taking out the fresh mint since I felt it gave it a really leafy green flavour which I wasn't fond of. But feel free to follow her recipe if you think you'd like the taste of the fresh mint. I tried using Oreos for the base, as well as Choc Ripple biscuits, and both turned out delicious, but I think I prefer the Oreo base. OMG it's a teeny tiny slice of pie with a teeny tiny spoon! This dessert is usually made as a full size pie, in a big pie dish, but I liked the idea of making little individual portions, it's always easier to share and there's a nice ratio of filling to crust :) Oh and an extra note for those who are wondering, it's going to be pretty quiet on the restaurant review front. I really haven't been eating out much, in an attempt to save money and calories, and am thinking about phasing out reviews from my blog completely. Thoughts? Comments? 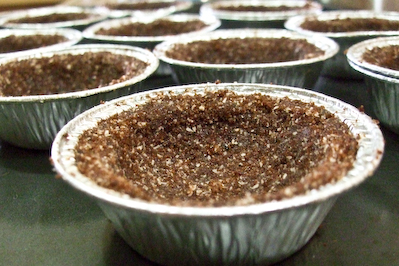 Press mixture firmly into individual foil tart shells, or you could also try using a greased muffin tray but you might have issues removing the crusts later. Bake in oven for about 10 minutes, make sure it does not burn. Remove from the oven and leave to cool, it should set once it cools. Place 2/3 cup of cream in a small saucepan with peppermint essence and vanilla. Bring to the boil over medium heat and then set aside to cool. 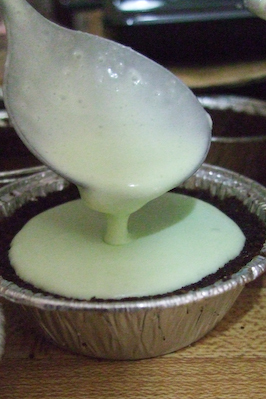 Beat remaining 3/4 cup cold cream until stiff peaks form and store in the refrigerator for later. 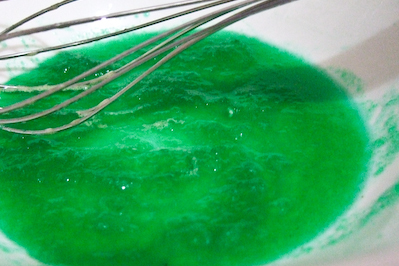 Place creme de menthe in a heatproof bowl and sprinkle gelatine over the top to allow it to soften. Place egg yolks and sugar in another heatproof bowl and whisk until the sugar has dissolved. Prepare an ice bath and set aside. 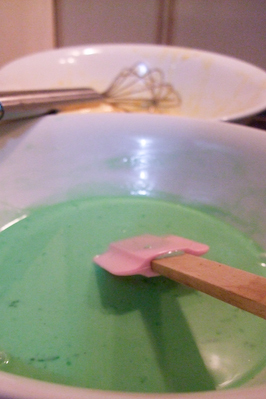 Carefully pour warm cream mixture into creme de menthe bowl, whisking to combine. Place this bowl over a pan of simmering water, whisking constantly for about a minute or two, until the mixture is hot and all the gelatine is dissolved. Whisking constantly, pour hot cream mixture in a steady stream into the bowl of egg yolks. Place this bowl over the double boiler and continue whisking for approximately 10 minutes. The mixture should be thick and frothy. Transfer bowl to the ice bath and continue whisking, the mixture should thicken further and be quite viscous. 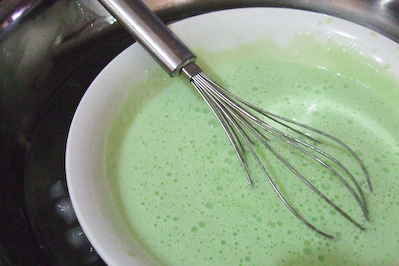 Stir in 1/3 of the cold whipped cream until combined, and then gently fold in the remaining whipped cream. At this point if you want your mixture to be a bit less runny before placing in pie crusts, place in the fridge for about 5-10 minutes. Spoon mixture into pie crusts and then chill in the fridge for about an hour, or until it sets. When ready to serve, remove from tart foils, and top with chocolate shavings. Optionally, you can top with some extra whipped cream. Have a great St Patrick's Day tomorrow everyone! Ha, I was expecting little grasshoppers either in these or on these :) As for whether to continue restaurant reviews, I say to keep doing whatever inspires you. Sometimes you find really great meals that you feel like you want to share with everyone, but your dessert recipes are always interesting and worth reading! 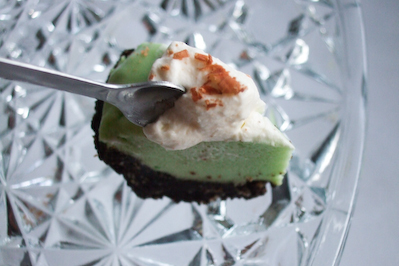 I've never had a grasshopper pie but it sounds delish! I love mint and chocolate together. And as for the restaurant reviews maybe you can keep them as an occaissonal thing but focus on your own cooking, instead of phasing them out completely. You always have the cutest cakes - great that you ensure that they are delicious, too. btw, I've also reduced my restaurant reviews. No one likes the pressure of having to produce something. Keep up the great cooking posts if that's what makes you happy. looks really good!!! Yeah, I'm waiting for more Glee too!! I've never been a big fan of peppermint and chocolate but this looks appealing. Great photos!!! I am definitely in the fanclub for choc mint, yes yes! As a good Catholic girl (haha!) I also approve highly of the St Pat's Day reference. These really look awesome, I am saving this recipe away! 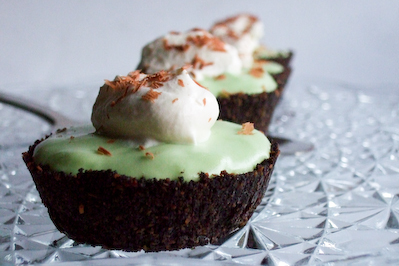 I love the idea of chocolate and mint and these grasshopper pies are so darn cute! Happy St. Patrick's Day to you too! Very cute! 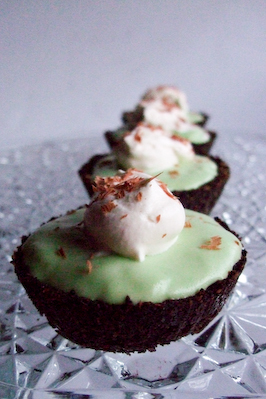 I'm including this on my st pats sweets roundup on Foodwhirl.com today! 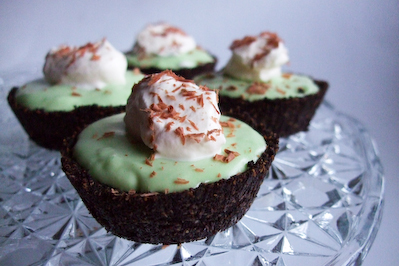 I had never heard of grasshopper pie until Glee. I then promptly queried wikipedia to satisfy my curiosity. Your recipe looks great and the mini pies look pretty cool. Steph, I too have reduced the restaurant reviews in aid of my budget and waistline. But do whatever you feel is best for you. I know I'll keep reading! I think I was one of the few ppl that wrinkled my nose when you mentioned it. Little did I know it contained 2 of my favourite ingredients, mint and chocolate, helloo AERO bar. Awesome mini pies, I like them tiny. I love your restaurant reviews, I think you should continue. Oh what an interesting sounding dessert you have here and oh so cute too! I like mint and chocolate too; just as long as the mint isn't too overpowering. Chocolate and mint AND cookies? 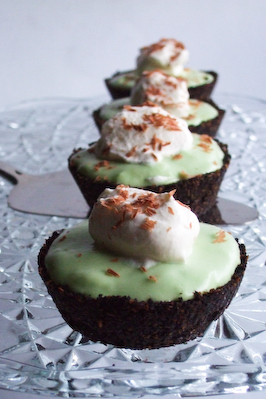 Grasshopper pies are full of WIN. Love the contrast between their dark shells and the lovely green insides. YUM chocolate and mint is a total winning combo for me - the way to my heart really!! I definitely have to make these. I think it's a this weekend job I want to taste some that badly!! PS - On a selfish level I wouldn't mind if you stopped the reviews - they make me homesick!!! Seriously though Hun, you do what you feel is right and what you have time for. No pressure from us! Helen - Haha :) You weren't the only one! Yes I think I will do it when I feel it's worth it, but I don't think I'll be pushing myself to churn them out as much. Aw thank you! Anh - It is fun! Belle - Aww thanks Belle! I agree, I'm basically doing what comes naturally to me, and at the moment it isn't going out to eat at restaurants! Betty - Good! I like stalkers :) haha...well as long as they aren't creepy. Not long til glee returns! Karen - Haha I will try ;) Thanks hun! Brenda - It's not for everyone, that's for sure. Thank you! Conor - Yay good! Haha thanks :) I appreciate the vote of confidence! Lorraine - Haha yes the random pie names are definintely a draw. You should try it sometime! oneshotbeyond - :) thank you! Mark - I had heard of it before, but it was glee that brought it to the top of my to-make list! Reemski - Yay :) Thanks! Eating out is so expensive sometimes! linda - haha I think you were :P Yes it is like an aero bar! in a PIE! I will try :) Thanks! Phuoc'n Delicious - Yes the mint is just the right amount in this, very mild. In fact I had to increase the mintiness from the original recipe cos it was so mild! Emma - Haha I agree! They are WIN!! cupcakexgirl - Ooh yes do make them! They're pretty easy and totally worth it. Chele - hehe yes i think it sounds like your workmate will love it! You're welcome :) Haha thanks!